KnowledgeTRAK provides a fast and easy way to create surveys that can be accessed online, as well as offline. It also allows you to use numerous fully customisable templates, and for a flat rate you can create an unlimited number of surveys! 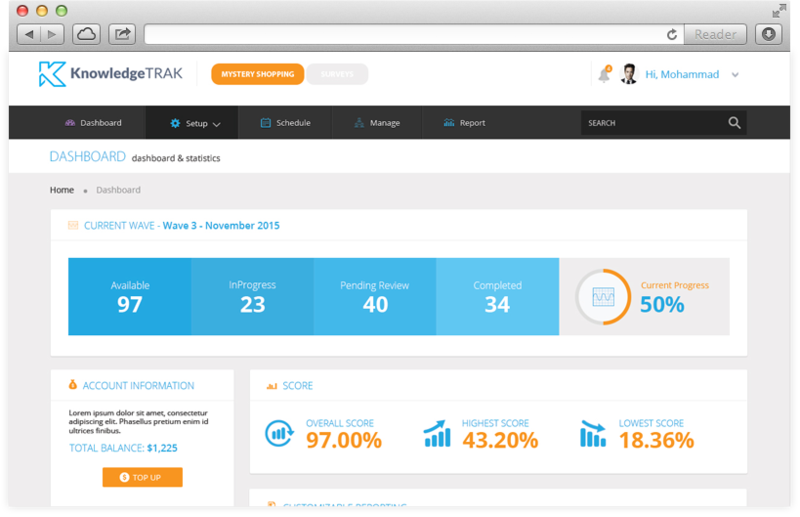 KnowledgeTRAK is a unique, multi-purpose software solution designed to collect, report, analyse and share real time Voice of Customer feedback! KnowledgeTRAK links companies to a large pool of mystery shoppers and researchers and allows them to create and run any type of Survey or Mystery Shopping assignment. KnowledgeTRAK is available in self-service or fully managed mode. KnowledgeTRAK was developed by Ethos Integrated Solutions, based on the company’s 12 years of experience in generating more than 2,000,000 surveys and 250,000 mystery shopping visits by thousands of shoppers. Its unique mobile and online capabilities will allow you to get to know your business through your customer’s eyes, by creating any type of survey or mystery shopping assignment to capture, report, analyse and share the Voice of your Customers in real time. KnowledgeTRAK has a large database of mystery shoppers and researchers who will help you gather and analyse ‘real-time’ feedback on your products and service delivery directly from the convenience of a Smartphone application. Get real-time results as they come in and generate any type of report through industry-leading reporting capabilities. Use KnowledgeTRAK’s advanced analytics to create eye-catching presentations, highlight performance trends and create follow up actions. KnowledgeTRAK – the one stop solution for all your customer experience measurement needs. At KnowledgeTRAK, our clients are the core of our business. The objective is to satisfy our clients’ needs by satisfying their customers’ needs. Our mission is to provide organisations with distinctive, lasting and substantial improvements in their overall business performance through continuous and excellent customer service experience delivery.